Attention travel enthusiasts! It is not yet too late to book your trips for the first 3 months of 2018. Check these latest promo flights! For as low as P1,099 All In travel to select local routes from Cagayan De Oro, Cebu or Davao. Other low fares also available for other Philippine domestic trips from Manila and Cebu for only P1,499. As for international travel, fly for as low as P1,699 Manila to Kota Kinabalu. For as low as P2,599 or P3,399, travel to famous overseas destinations: Hong Kong, Singapore, Ho Chi Minh, Jakarta and more. Are you interested? Book the promo tickets from today until December 15, 2017. Seats on sale are limited and may not be available on all flights! Inclusive of 7 kilos cabin baggage, the Cebu Pacific promo fares are valid for one-way trip. The base fare, Web Admin Fee, taxes & fees and domestic terminal fees already included in the ticket. Promo fares are non-refundable but an be rebooked subject to rebooking fees plus fare difference (if any). Purchase the affordable tickets at accredited ticket booking offices and travel agents. 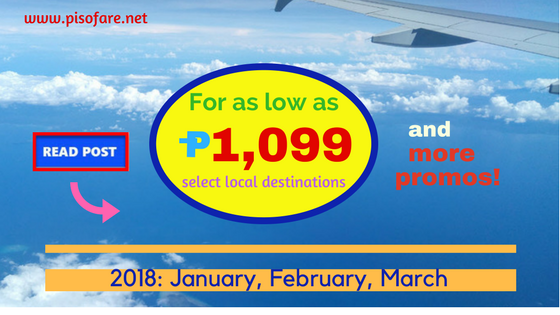 Sale tickets are limited, thus if you would like to get the lowest fare for your trip, book online at www.cebupacificair.com where promo code is not required in booking. Online booking is the fastest way to search for affordable fares that fits your budget. There are several ways to pay for tickets book online like: a) Pay via credit card, b) online payment thru BancNet, Paypal, Alipay and c) Payment Centers (you can pay either before midnight of your booking date, or within 24 hours from booking). In case you will be bringing heavy bag or several luggage, you can save if you buy Prepaid Baggage during booking (lowest check baggage rate) or up to 4 hours prior to flight departure. So, do you want to get the cheap fares? Then, book or buy your ticket now! Promo fares are limited in availability, so don’t wait too long to decide. Want to receive promo updates of Cebu Pacific Air, Philippine Airlines, Air Asia and other airlines? LIKE us in Facebook: PISO FARE TICKET to get notification on seat sale and travel tips and updates!